Owning a parcel of land is the dream of many. Whether it’s ten acres or several thousand, land ownership represents an investment in a solid, tangible asset – one that holds intrinsic value to the owner and signifies means and permanence in society. In order to ensure that the land for sale provides the enjoyment and utility that the buyer is seeking, it is critical to thoroughly research the property before entering negotiations to purchase. We call this due diligence – that is, ensuring the property satisfies all of the buyer’s criteria. So, what should a prospective buyer consider? The following is the first of a three-part list of key items with a brief primer to get one started on the due diligence process. This is perhaps the most critical characteristic influencing value. The nature and extent of access dictates the type of uses the parcel can offer. Does the parcel front a publicly-maintained road with power and utilities? Does the parcel have a deeded right-of-way across an adjacent landowner? Does the condition of the road surface (e.g. 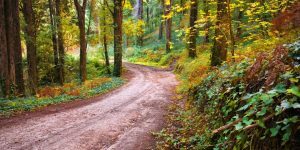 gravel vs. pavement) relegate it to seasonal or year-round use? Research the access thoroughly and understand all the associated benefits and limitations to be sure you can use the parcel as you envision. Parcel boundary markings exist in many forms and, in some cases, not at all. In New England, it’s common for a parcel to lack a survey. Centuries-old deed descriptions actually referred to trees “where Philo Blake killed the bear,” as boundary markers – as if the tree and the notable event would stand the test of time. Always inquire first if a survey exists. It doesn’t necessarily have to be registered at the county registry of deeds, but it must have the imprint of a licensed surveyor to be legitimate. If no survey exists, start with the deed description and obtain a copy of the town tax map. However, beware of the latter source as most municipal tax maps are meant for general location reference and not boundary identification. On forest land properties, boundaries typically exist as blazed, painted marks on the trees. (A blaze is where the outer bark has been removed and paint is applied.) The blazes can be any color but are often red, yellow or orange. Many boundaries also exist in the form of stonewalls and/or barbed wire. Such boundaries are more common in southern and central New England but less so in northern regions where large forested tracts have been managed for their timber for decades. When physical evidence and legal documentation is lacking or uncertain, a licensed surveyor may be necessary to locate and re-mark the boundaries. Don’t be afraid to engage a professional to help you ascertain the parcel boundaries. It will be money well spent. A registered deed is the most important document to review. The seller or his/her broker can provide you with a copy. In some cases, you may need to obtain one from the town or country registry of deeds. Many registries are on-line and one can easily download copies of the deed, sometimes for a nominal fee. The deed confirms the owner’s identity, who they purchased it from, and when. Most importantly, it provides a physical description of the property, and references any encumbrances or exclusionary rights of other parties – e.g. “excepting and reserving a 50’ right-of-way to Edna Johnson, her heirs and assigns, to access her property…” Other encumbrances may include water rights held by an adjacent landowner to a natural spring on the subject property. Likewise, there can also be mineral rights, timber rights, gravel rights or a camp right held by another person or entity. In some cases, these rights can be extinguished by negotiation with the third party. Read the deed carefully – more than once – and understand what is for sale, where it’s located, and any encumbrances that may exist. It is strongly advised that an attorney review the deed prior to sale, often done as a contract contingency, and that they conduct a thorough title search to ensure a “clean, marketable” title. There is no substitute for sound legal review in the acquisition process.